Born and raised within the city limits, I was never far from an outpost of The Free Library of Philadelphia. I can remember vividly the day I left the Holmesburg branch, a proud preschooler clutching a wisp of orange cardstock that allowed me to borrow any book I wanted. It was a great privilege to spent an overnight or two at my Grammy's house; if I was really lucky, she would have books to return while I was there and take me with her to the branch in her Olney neighborhood -- a whole new building filled with opportunity. I spent many summers attending Vacation Reading Club, first as an participant at the Northeast Regional branch, and then as a volunteer at the Tacony Branch. For my Girl Scout Gold Award, I had to perform 25 hours of community service. I lived and breathed the Andrew Carnegie-funded Tacony Branch Library, and those 25 hours turned into two summers and three school years as a volunteer in the Children's Department. I spent many weekend afternoons researching all kinds of subjects for school assignments, usually at the Regional branch. When required to write a term paper - "The Sociology of Concentration Camps in Nazi Germany" - for AP History, I stocked up on rolls of dimes to feed the microfiche and copy machines, took the Frankford El into Center City, transferred to the Subway-Surface Trolley, and practically took up residence in the Central Branch. Several helpful books were listed in the card catalog but no longer available on the shelves; these tomes originally printed in the 1930s were kept in the climate-controlled basement and could be viewed only while wearing cotton gloves and within sight of the librarian. It was sitting at a computer in Temple University's Paley Library that I met Neal, and eventually he and I were standing outside that same building when he dropped to one knee and asked me to spend the rest of my life with him. Libraries are a wonderful place, and so incredibly important. Books are meant to be read by everyone, not just those who have enough income to purchase them. Unfortunately, due to budget restrictions, many libraries are slashing inventory and hours. Where we live, the local libraries are very small, and the larger branches are a significant distance away. Sometimes, borrowing a book from a library isn't practical because you need it for more than the two or three weeks allotted. Either it's a book you want to use for several weeks or a semester, or you know will be handed down through the family, or it has just become your newest favorite and you don't want to give it up. I love the feel of a crisp new hardback, and the creased spine of a well-loved paperback, but I also have come to love e-books. Storage space isn't an issue -- when you can read a book or two a week, that's a definite consideration! I can take my iPhone with its Kindle App e-reader to a doctor's appointment and have a plethora of stored books to choose from; when the doctor runs hours behind and I've read everything in my account, I can download another book and have something new to read within seconds. This has been a sanity saver when we've had hospital stays that have dragged from days into weeks. I've also found that e-books can be more economical than paper books. Many libraries now offer e-books, but again, you are subject to budgets and expiration dates. With a personal e-library, there is a whole virtual library filled with thousands of books just waiting for you! While there are a number of e-book sellers, Amazon.com is my favorite. They claim they offer "millions" of e-books. Impressive as it was, if Beast's castle had a library of millions of books, I bet Belle would never have gone back to her village for any reason. A basic Kindle can pay for itself in book savings, and Amazon also has free alternatives for numerous operating systems, from iPhones to PCs. This is a partial list of what is currently on the New York Times Best Seller's List. Look at the difference between the list price and the Kindle price. Even Amazon's discounted price for a hardcover edition is almost 50% higher that the electronic version of Whiskey Beach. For many classics, e-books are less expensive than paper counterparts. Check the comparison chart! This paperback costs nearly 3 times as much as the electronic version. There are even a lot of FREE classics out there! Better than library books -- because they are free AND yours forever! Plus, they're yours in seconds -- no leaving the house or waiting for delivery. 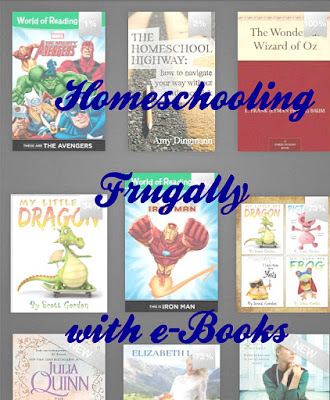 There are even a good number of children's books available in e-book format. These are some of our favorites. In addition to fun books and school books, electronic cookbooks are available. I love cookbooks. I'm a generally voracious reader, but you could say I devour cookbooks! This is one of my favorites. Something that is fantastic about having it available on my iPhone is it no matter where I am, I have it with me. I've been able to bake treats while on vacation! Marcy from the blog Ben and Me keeps a great list! Here's another blog with lists. 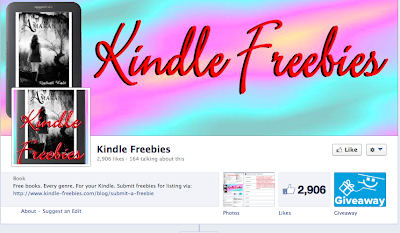 There are also a number of Facebook pages where freebies are shared. These are two of my favorites. Seriously, I love ebooks, too. 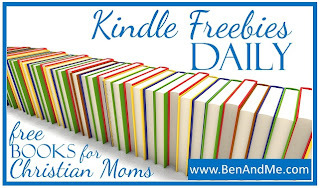 I always use the Kids with Food Allergies referral code for Amazon - http://www.amazon.com/?tag=kidswithfooda-20 - so they get a portion of the profits from the cheapie books. I get a book, they get a donation - sounds like a good reason to read even more! I love libraries. That's one thing I miss about my time as a kid in the States. Our library here is very small with a larger selection of Afrikaans books than English books. I gave up looking for something that I would like. Also, the books don't get updated here much. My 12 year-old read all the Nancy Drew Mysteries that they had over a couple of weeks. That was a happy-sad moment. 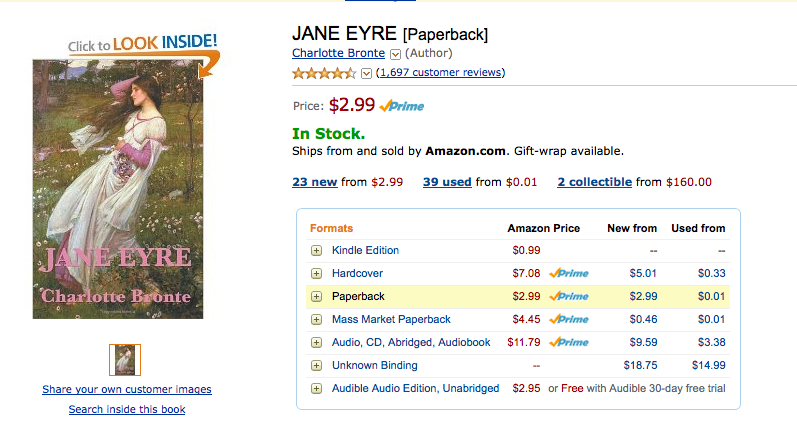 I had a copy of Jane Eyre when I was a kid and read that a couple of times. It's a fabulous book.The Lone Wolf eBook is surprisingly inexpensive and looks interesting. Maybe I should get that for me. :) Thanks for linking on Amanda's Books and More!